It's no secret that I LOVE sweet potatoes (I even affectionally refer to Snoopy as one)! Every year at this time, I look forward to sweet potato pie. I eat one before the week of Thanksgiving, one during the week of and another one after. This is my holiday ritual which should have begun last week but we hit a snag when I went to the bakery at our local grocery store to look for one. (Now, I would have made myself one but it was midweek and I was too tired from work to whip one up). So there I was at the store hunting among a thousand pumpkin and pecan pies for the glorious sight of one that would have the words "sweet potato pie" inscribed. Nothing, seriously nothing except for one miserable and overly sugary, frozen pie! I got the pie and picked up several pounds of sweet potatoes so this wouldn't happen again. I made a pie and then some babka! 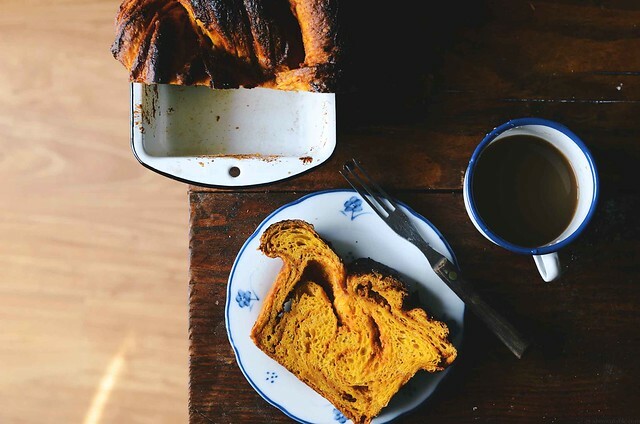 There was a lot of inspiration for this babka. 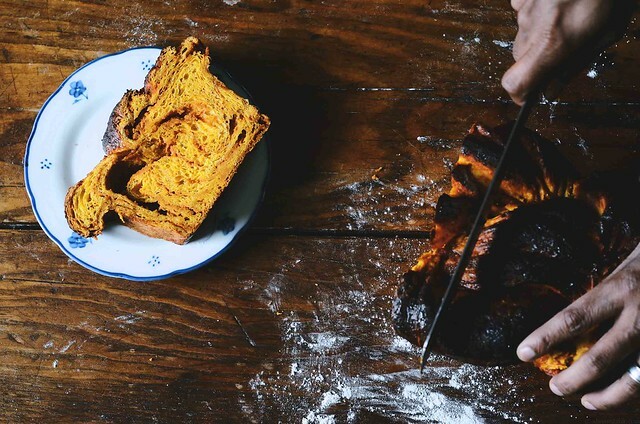 It started with Michelle's gorgeous salted chocolate and pumpkin babka that in turn was inspired by Yottam Ottolenghi's Jerusalem. My version is adapted from the basic recipe in The Cook's Illustrated Baking Book which I modified. This is another great book to learn to bake from, there's science and technique which make it one of my favorites. 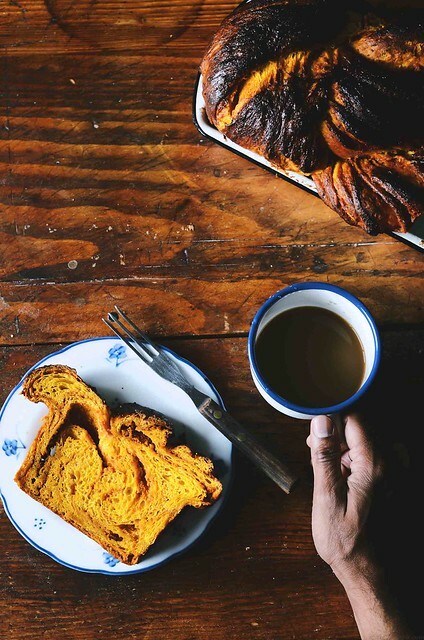 If you're looking for a fun holiday breakfast treat or for that matter an anytime breakfast bread, this babka does it! 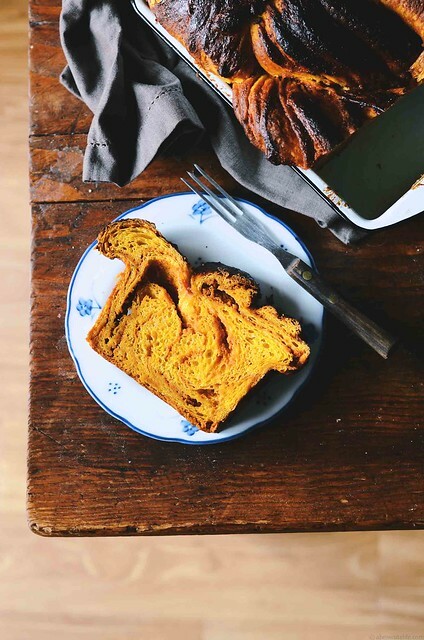 Not only does it encase swirls of sweet potato and nutmeg but it also has sweet potato infused into the dough which gives it a lovely bright yellow color. Plus, now I can eat sweet potato pie for breakfast and dessert, so it's a win all the way. 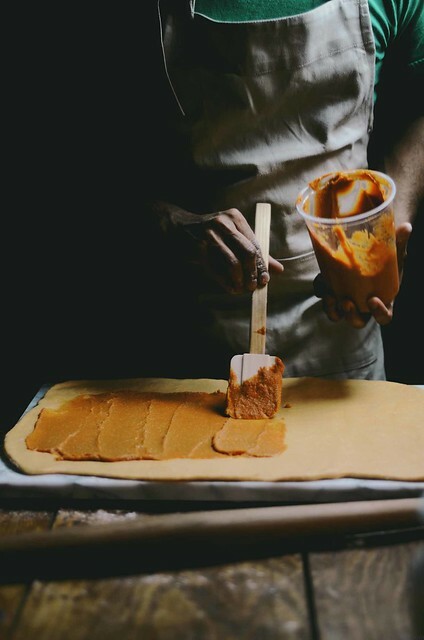 I make my own sweet potato purée by oven roasting about 1 lb of sweet potatoes (with the skin) at 350F on a baking sheet for about 35-40 minutes until it is completely tender in the center and a knife can pass through easily. I then let them cool completely, this will allow the skin to shrink and it will peel off easily. I think chop the pulp and blend it using an immersion blender or food processor until silky smooth. When using an immersion blender or weighing ingredients, I love to use those plastic containers that you get with takeout meals. Save them the next time, it's a great way to reuse. Use fresh nutmeg, it makes a huge difference. Add a little more if you like more flavor. 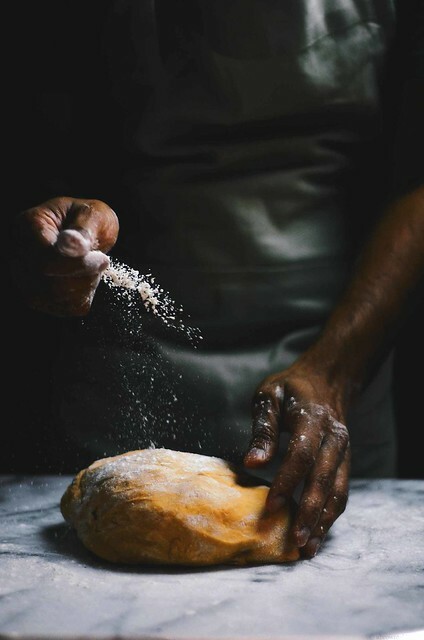 Instead of adding all the flour at once, I found that adding a little bit towards the short kneading stage helps to bring the dough together and gets rid of the stickiness. You can use any dry mix of spices that you like to flavor your sweet potato pie with. I like to add ginger or 5-spice mix. 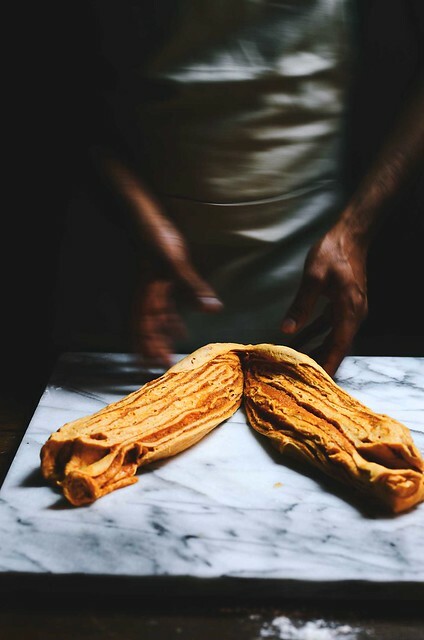 With regards to the folding and getting those layers in the babka. 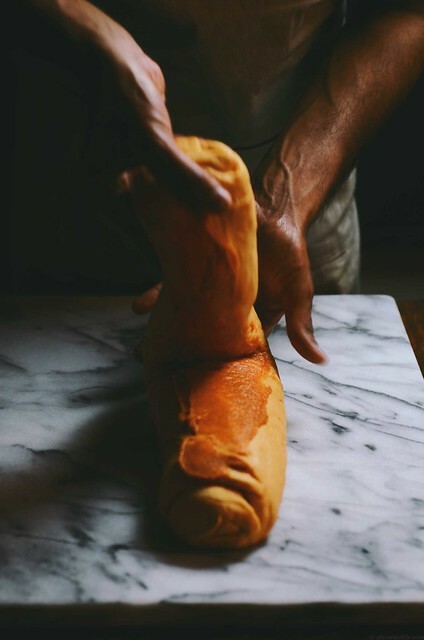 Roll the dough out as thin as possible. I used the method used to make Krantz by cutting through the cylinder of dough and then braiding, it like Michelle suggested. 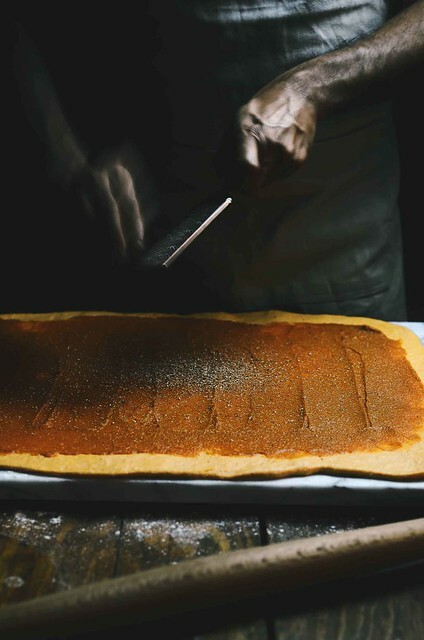 Egg white and almond flour help to bind and stick the sweet potato filling to the dough. And I didn't get any almond taste that took away from the sweet potato pie filling. 1. Take one cup of the sweet potato purée in a medium bowl. Add the white of one egg, 1/2 cup brown sugar, 1/2 teaspoon vanilla, almond flour and salt. Blend all the ingredients together using an immersion blender (alternatively, transfer all of this into a blender and purée until silky smooth). Keep refrigerated until ready to use. 2. In a separate mixing bowl, whisk 2 egg yolks, the remaining 1 cup of sweet potato purée, 1/2 teaspoon vanilla, and milk, until completely combined. Keep aside. 3. Add 3 cups of the flour, 1/4 cup brown sugar, salt, and yeast to the bowl of stand mixer. Dry whisk until mixed. Attach the dough blade to the mix and set the mixer to low speed. 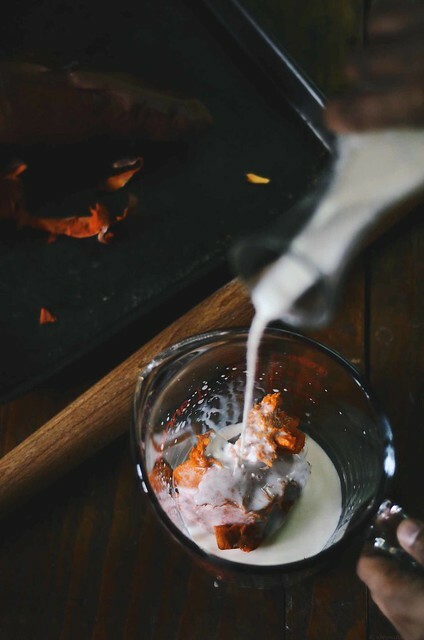 Pour the milk-sweet potato liquid into the dry ingredients and mix for about 3-4 minutes until almost combined. Stop and add the cubed butter, a little bit at a time until completely incorporated. The dough will start to come off from the sides and will be sticky. Transfer the dough onto a clean lightly dusted surface. 4. Using the remaining 1/2 cup of flour bring the dough together to form one large ball. Place the dough in a large clean bowl that is lightly greased with a little neutral tasting vegetable oil. Brush the dough with a little oil. Cover the bowl loosely with a cling film and allow to rise and double in volume for 1 hour in pre-warmed oven (preheat the oven to 200F for 5 minutes, then switch it off). After 1 hour remove the bowl from the oven and allow to rise at room temperature for another hour. 3. Transfer the dough back onto a clean surface. 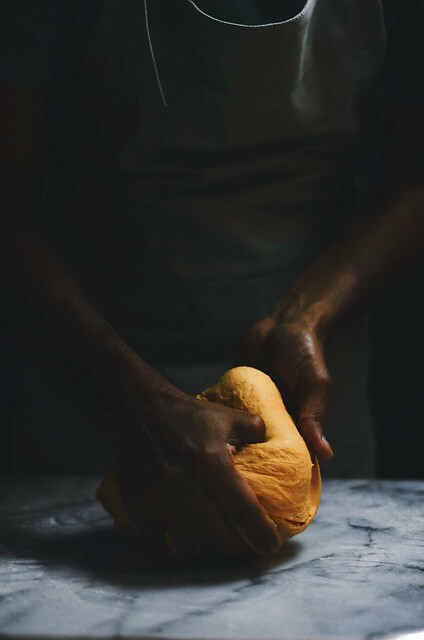 Divide the dough in half and work with one half at a time. 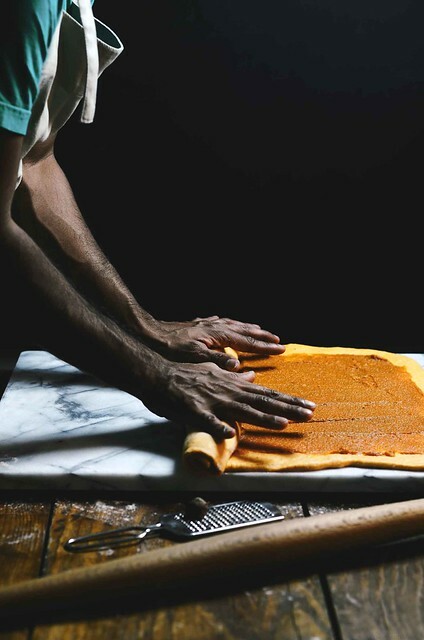 Shape one half of the dough into a rectangle with your hands and then using very little extra flour roll it out into a thin rectangle that is approximately 14 X 20 inches in area. 4. Take 1/2 of the sweet potato filling and reserve the second half for the second loaf. Spread 3/4 of this filling prepared in step 1 in a smooth layer with a spatula. Sprinkle half of the nutmeg over the sweet potato layer. Then starting from the shorter side of the rectangle, roll the dough into a cylinder. Pinch to seal the ends and shape the cylinder with your hands. Spread the remaining amount of filling over the top surface of the cylinder. Then fold it over in half and seal the ends again by pinching the seams. With a sharp serrated knife cut through the length of the cylinder and divide in half. Then braid the two strips of dough with each other to form a double figure 8 shape. Place it in a well greased loaf 9X5 loaf tin. Wrap the tin loosely with cling film and allow it to rise in a pre-warmed oven for 2 hours or until doubled in size. Repeat steps 3 and 4 with the second half of the dough to prepare the second loaf. 3. Prepare the egg wash by lightly whisking the whole egg with the water. Brush the surface of each loaf with the egg wash and then sprinkle 2 tablespoons of the brown sugar over each loaf. 4. 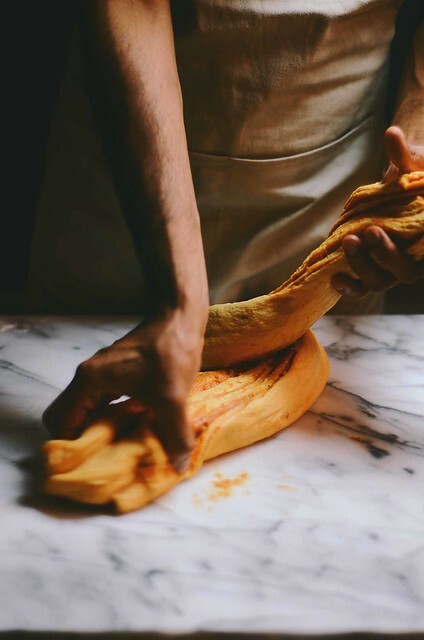 Bake each loaf in the center of an oven preheated to 350F for about 45 minutes or until the surface is golden brown (the sugar will caramelize and give a lovely crust) and the internal temperature reaches 190F. Remove from oven and allow the loaves to cool in the pan placed on a wire rack completely before serving.